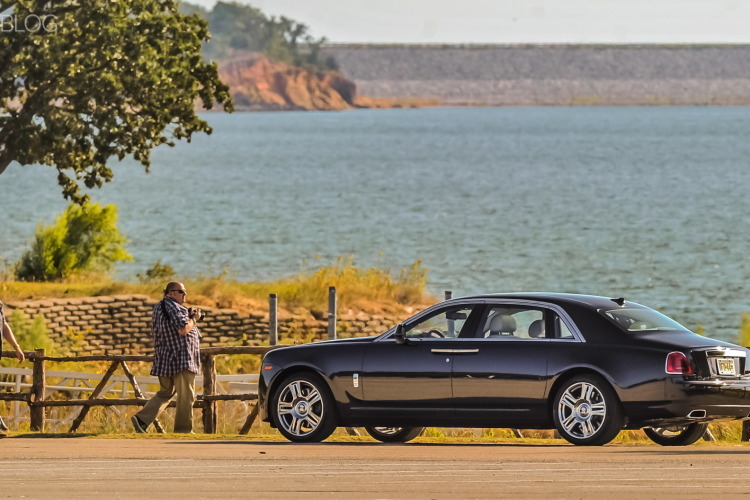 Currently, the Rolls Royce Ghost sits on BMW’s old 7 Series platform, while both the Phantom and Cullinan are on an all-new, aluminum-intensive, bespoke Rolls Royce platform. We’re not entirely sure what platform the new Ghost is going to sit on; whether it be the new Rolls platform or BMW’s CLAR, on which the current 7 Series and X7 are based; but we do know that it won’t be the same as the current car. In these spy photos, it’s hard to tell exactly what the Ghost will look like but there are a few interesting bits to point out. For starters, the front end is clearly Phantom-inspired, just without the flagship car’s massive grille. The rest of it though looks…dare I say sportier? For a Rolls Royce, this new Ghost is low and sleek looking. It still has some classic Rolls Royce design cues, like the upright grill and the massive C-pillar, but the latter sweeps down low into the rear end really smoothly. It doesn’t seem as boxy or as broad shouldered as other Rolls and seems almost sporty, as blasphemous as that is to say. In fact, I better temper my sporty talk lest I get hanged in the Tower of London. Though, it also seems to sit rather low, with a relatively low ride height for a Rolls. We’re wondering if the Brits are planning on making the upcoming Ghost/Wraith (latter is the upcoming coupe) more of the Rolls Royce you want to drive, while the Phantom is the one to be driven in. Not to say that any Rolls Royce is a driver’s car but the Ghost could be the sort of “daily driver” equivalent for the Rolls customer. Powering the new Rolls Royce Ghost will almost certainly be a V12 but we’re wondering which one. It’s likely to be the 6.6 liter twin-turbo V12 from the BMW M760Li, as Rolls Royce’s own 6.75 liter twin-turbo V12 is likely to be reserved only for the flagship Phantom. We can’t wait to see what becomes of the new Rolls Royce Ghost. As the smaller, more enjoyable Roller to drive, it should be very exciting to see where the folks in Goodwood take it.